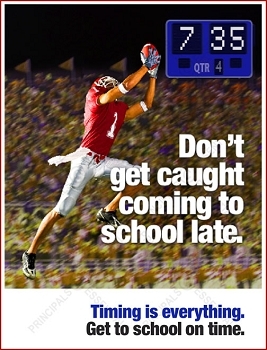 Our Tardy Prevention Posters, customized with your own school start time, will help tardy students understand the PROS of being on time and staying in school. - Missing 10% of school (18 days) can make it harder to learn. - Being late to school can lead to poor academic performance. - Absences can affect the whole classroom if the teacher has to slow down learning to help children catch up. Attending school regularly helps children feel better about school and themselves. Start building this habit in preschool so they learn right away that going to school on time, every day is important. Good attendance will help children do well in high school, college, and at work. Customize the football jersey to your school color. Change scoreboard clock to anytime. Increase school attendance and academic performance. 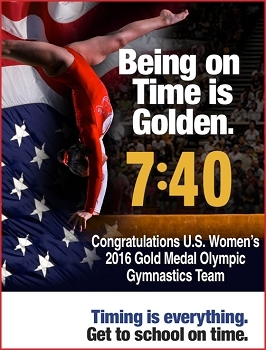 Change 7:45 to any time. 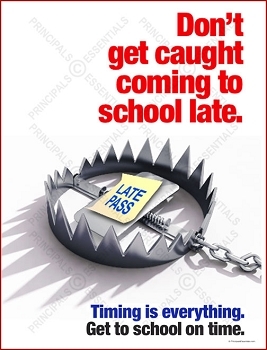 Improve school attendance by reducing student tardiness! Lower school dropout rate! Change 7:35 to any time. Play it safe! Get students to school on time. Change 8:00 to any time. Increase attendance and academic performance. Change 8:45 to any time. 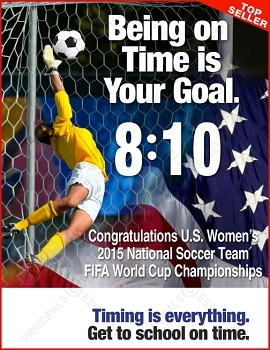 Customized school posters with your school's start time. Absence from school and class is the #1 cause of poor student achievement. Change 7:30 to any time. Change 8:15 to any time. 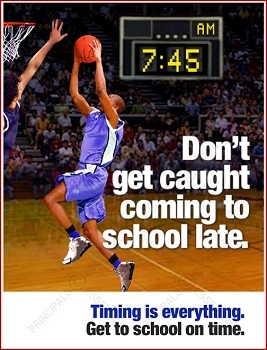 Encourage students to get to school on time. Tardy Prevention is Golden. Change 7:40 to any time. 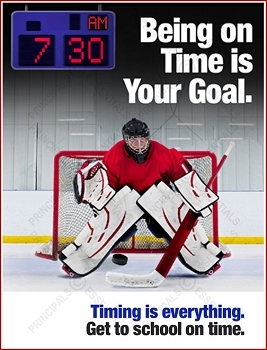 If perfect school attendance is your GOAL, this is the tardiness prevention banner for you! 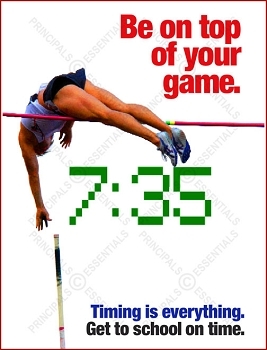 Your school start time is printed on every tardy poster. Change 8:10 to any time. 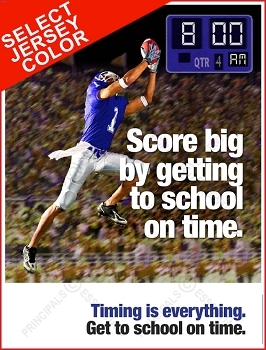 Score Big with Tardy Prevention. 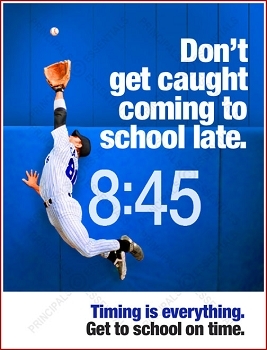 Your school start time printed on every tardiness prevention poster. Being on Time is Our Goal. 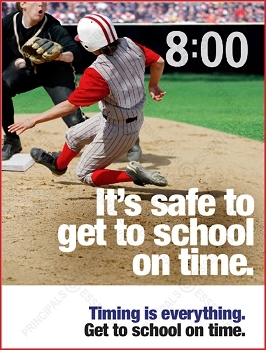 Your school start time printed on every tardiness prevention poster. Play it Safe. 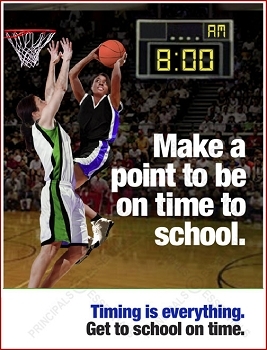 Your school start time printed on every tardiness prevention poster. Build the Habit of Good Attendance! Attendance Plays a Key Role in Drop Out Prevention : The majority of students who drop out first start coming to school late and then stop attending school on a regular basis. 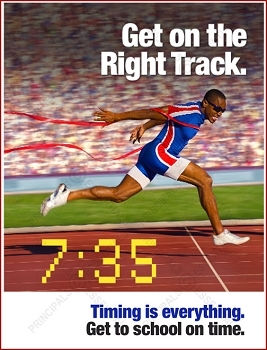 In many cases their tardiness increases and attendance decreases over several years. In the year before dropping out, it is common for students to attend school less than 70 percent of the time. Absence from school and class is the #1 cause of poor student achievement. A Better Strategy & Attendance Policy: In some districts, no formal response to student absence or tardiness is required until students miss a certain number of consecutive days (e.g., five). This tells schools it is okay to do nothing until it is almost too late. It also leads some students to become expert manipulators of the system, always missing one day short of a mandatory response. A better policy demands that every absence or lateness have an immediate action to help students understand the importance of being punctual to school or a job. 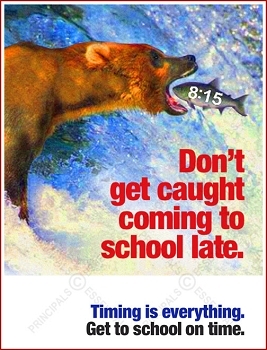 And because young minds require repetitive reinforcement, it is crucial to post school start times throughout your building to remind students of their daily responsibility to be on time to school or class. Early School success goes hand in hand with good attendance!